2014 Best Blues Album Grammy Winners! 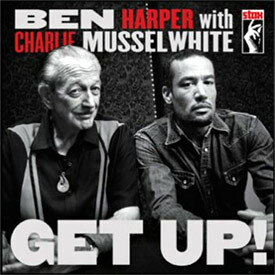 Ben Harper and Charlie Musselwhite have garnered a lot of press with their CD "Get Up". Not only have they won the 2014 Grammy Award for Best Blues Album; they also had a nomination in the Best Music Film category for their film "I'm In I'm Out And I'm Gone: The Making Of Get Up!". In 2013 they performed on The Tonight Show with Jay Leno. Ben and Charlie have also appeared on the cover of Downbeat magazine, received a photo op in Rolling Stone magazine, and an article on PopMatters.com. Ben Harper and Charlie Musselwhite: Get Up! In other recent news, Esquire.com premiered a new live video of Ben & Charlie performing the album opener, "Don't Look Twice." for a rendition of Led Zeppelin's version of "When the Levee Breaks"